﻿ Your Holiday Email Template Checklist » Red Mango Marketing! The leaves are changing here in New England, which means the holiday season is nearly upon us. Perhaps you have some creative ideas for your holiday email marketing, but do you have a holiday email template that will turn your ideas into conversions? To get that click, download, phone call, sale, or donation, you need a well-structured email that engages, informs, and drives action. Here’s a handy checklist of elements you’ll want to include in your holiday email template. The three elements of the header are the first impression your future holiday shoppers see in their inbox. The header helps you paint a picture of who you are and why you’re sending. The subject line is particularly important because it’s a decisive factor in whether or not the reader will open your message. If you need help with subject lines, take a look at these good email subject lines. Your preheader text acts as a second subject line allowing you to further entice your reader to open your email. Once the reader has decided to open your holiday email, the first thing they should see is your logo. The logo reinforces that the message is from your company. Be sure your logo links to your website as a best practice. When thinking about your text and images, or the content of your campaign, there is a rule of thumb you’ll want to follow: 20 lines of text or less and three images or less. A Constant Contact study found that email campaigns with a combination of 20 lines of text and three images induced the highest click-through rate. Since you’re focused on driving clicks or actions, you want to keep your eyes on the prize. The text and images you use in your email template should lead your reader toward the conversion. 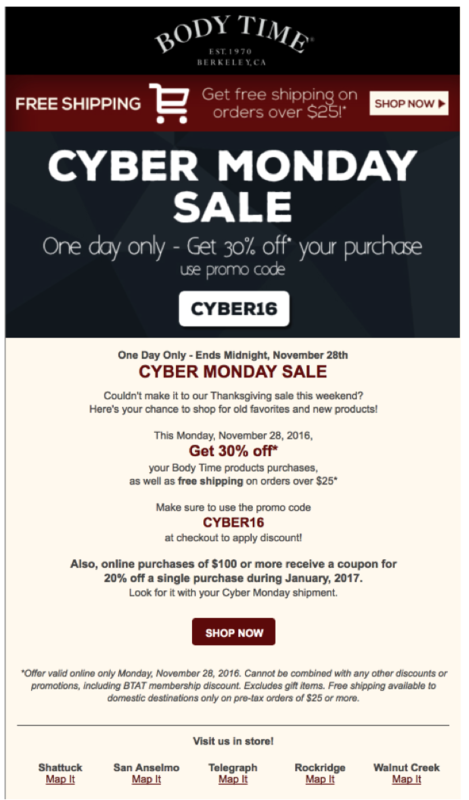 Take a look at the Cyber Monday holiday email template that BJC Branding created last year for an idea of how we structured Body Times’s images and content to drive the sale. 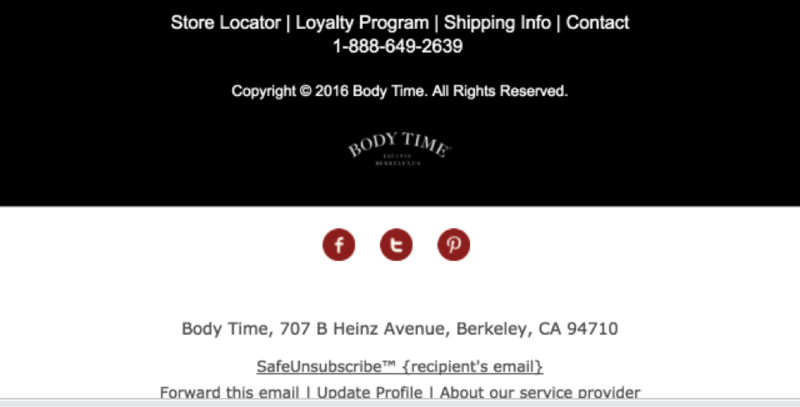 Your holiday email template ends with your footer. The footer should include links to your social media profiles as a secondary call-to-action to grow your overall digital marketing presence. You should also include fundamental information about your business either directly in the email footer or as links to your website and a phone number for those who prefer to call you. Finally, as a Constant Contact user, you automatically include the ability to unsubscribe from your email contact list, which is mandated by the U.S. CAN-SPAM legislation. Use the expert marketing tips and insights above to make sure your holiday email template is built out correctly before your next send. Before you know it, Black Friday will be here, and you’ll want to put your best digital foot forward to make the most of the holiday spending season. Have questions about your specific campaigns? Ask them in the comments below. 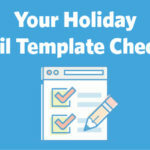 The post Your Holiday Email Template Checklist appeared first on Constant Contact Blogs. This entry was posted on Monday, October 23rd, 2017 at 9:05 am	and is filed under Email Marketing, News & Updates, Online Marketing, template. You can follow any responses to this entry through the RSS 2.0 feed. Both comments and pings are currently closed.